Mogumber Park and Oakland Park Studs are pleased to announce they have jointly acquired an exciting new stallion SAFEGUARD (AUS) to stand the 2015 season at Mogumber Park in Bullsbrook. 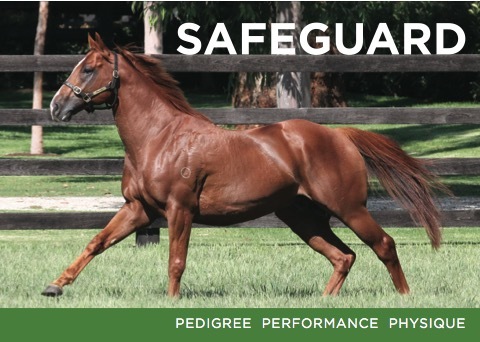 SAFEGUARD (AUS) is a dual Gro winning son of EXCEED AND EXCEL (AUS), considered the world’s greatest sire of 2 year olds. He is out of a Group 1 winning mare (VRC Sires Produce) who is a half-sister to DENMAN (AUS), also a Group 1 winner. And he could run! SAFEGUARD (AUS) won his first three starts including the Group 3 ATC Kindergarten Stakes and the Group 3 MRC Vain Stakes, before going down narrowly in the Group 2 VRC Danehill Stakes. SAFEGUARD (AUS) will stand his first season at a stud fee of $8,000 plus GST (Free Return). The right to send two mares per LBR for the first three breeding seasons (2015-2017). The right to send one mare per LBR per season to the stallion for the rest of his breeding career. The right to send a third mare in Year 1, and only pay an additional $4,000 +GST if a third pregnancy is achieved. The right to transfer the LBR (i.e. you may sell it at a later date). All costs involved with keeping and advertising the horse, which will be borne by Mogumber Park and Oakland Park Studs. In addition, 12 months insurance cover on each LBR for All Risk Mortality and First Season Infertility has been arranged and is available for the premium of $1,687.95 including GST and Stamp Duty. This is a very sound investment. If you never breed to the stallion again after 3 years, your average nomination cost is only $3,000 plus GST to one of the most exciting young stallions to come to WA. Please note that only 20 Lifetime Breeding Rights are available for purchase. We thank you for your consideration and would be only too pleased to discuss any further queries you may have regarding SAFEGUARD (AUS) himself, or the Lifetime Breeding Rights.